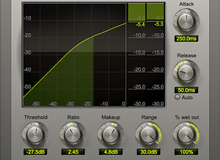 SKnote SDC - Stereo Double Compressor - "An excellent plugin!!!" Acustica Audio Tan - "My teacher said this would make the voice warm"
ToneBoosters TB Barricade 4 - "An excellent limiter that surpasses many others"
Klanghelm MJUC - "Klanghelm MJUC. Just Great !" Elysia Alpha Compressor Plugin - "Very well programmed and modelled"
Audio Damage Rough Rider [Freeware] - "Audio Damage Rough Rider"
PSP Audioware VintageWarmer 2 - "Vintage warmer review"
Waves Renaissance Compressor - "A Really Nice Compressor"
FabFilter Pro-DS - "Sibilance be gone"